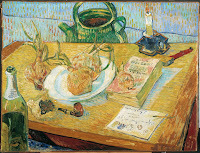 The Van Gogh Museum in Amsterdam is showing its latest Van Gogh exhibition until Sunday 25 September. Let me first turn to one painting in particular (see left). It shows trees in an orchard or perhaps garden setting. It's cool, precise work, a single figure in the midground striding towards what seems to be a building on the right. The painter's analytical eye captures everything: the scale of the trees compared to the human figure, the tree roots, the shrubs; the gnarled branches of a robust species, right down to the sandy brown earth beneath. Look at the black lines the painter uses to outline the main shapes. There is an almost geometrical precision in the way the trees are shown to grow out of the earth. I don't think Van Gogh rested. It's all so fresh, so vigorous. He used this same analytical technique for many of his paintings, especially perhaps, the late ones. 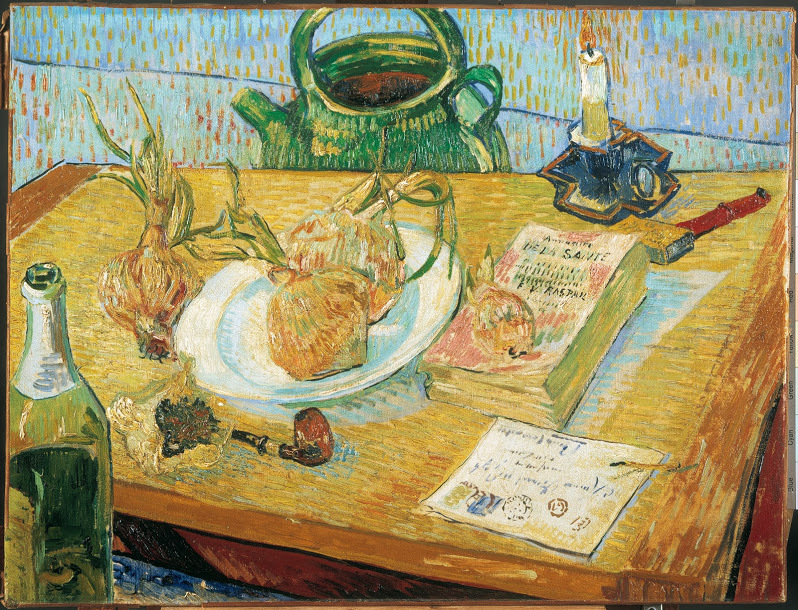 Still life with a plate of onions, for instance (below) was painted in the same year as his tree painting, 1889, the year before he died. 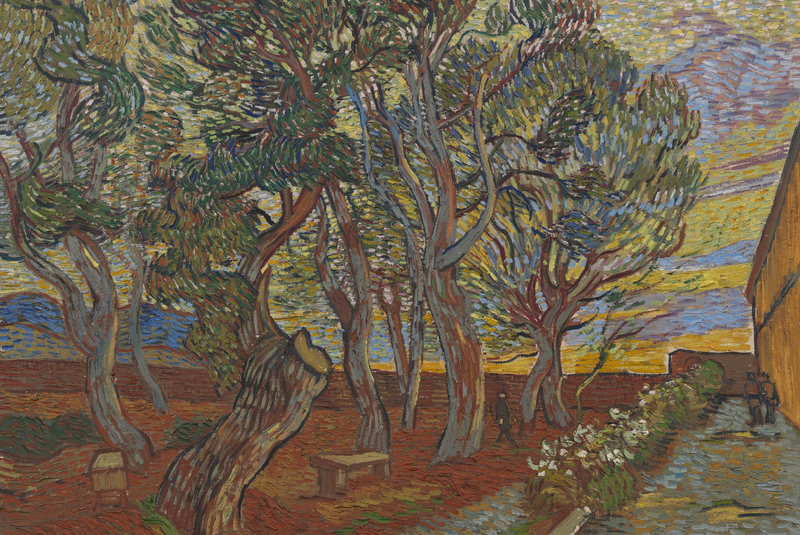 Van Gogh's tree painting could be called "Trees of the Garrigue" (the term for the predominantly limestone soils of this part of Provence), or "Trees near Arles" where he produced so much work while staying at the Yellow House. Its title? Garden of the Asylum. This new exhibition, On the Verge of Insanity: Van Gogh and His Illness, examines all of this: the myth and reality (or at least what is known of the reality) of the before and after of the painter's stay at the clinic of Saint-Rémy. It shows the works he started or completed during this period. It even shows the gun with which he is thought to have shot himself that day in July 1890. Van Gogh brought a new eye to these landscapes that were so different to the predominantly alluvial landscapes of his native Netherlands. His close analysis of this scrubby forest floor that requires plant roots literally to delve into the limestone rock beneath, gradually breaking its surface, places it in many ways a heartbeat away from the abstract. Make a point of looking at Sunset in Montmartre, painted in 1887. If you think that here Van Gogh was able to look below the surface to produce a near-abstract rendering of the scene, the Museum would agree with you. The light and colours of Provençal France also influenced the artist's palette; his way of looking meant that he used colour not just to produce pretty pictures but as a way of heightening the emotional intensity both of his work and of the landscape he depicted. No other artist I think has shown Earth to be such a working environment or, indeed was so unsparing of himself in order to do so. Look at what he's painting in (the unfinished) Tree Roots (below), look at how he's painting. This, as I've mentioned, is rock, limestone. First mosses and lichens then seeding plants use their roots to break into the rock surface, gradually working it into smaller and small particles so that it can let in the rain and windblown nutrients that the plants also need to survive. This is how soil is formed. 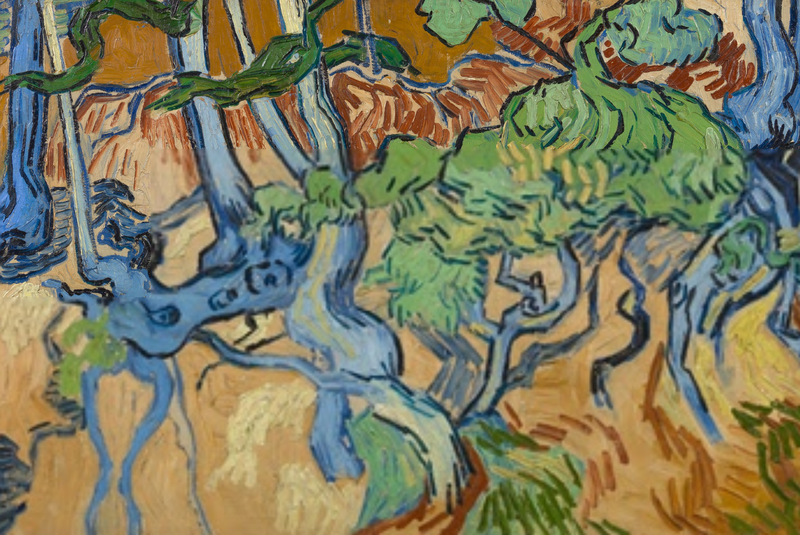 Somehow, from his enquiries or his reading, Van Gogh 'reads' this landscape and the plants therein. His vision, always acute, is now hyperacute. This could be from his medication or the result of the situation he finds himself in. A risk to others and himself, he has, in today's parlance, been sectioned. Free to come and go during the day, he must return to the asylum each evening. The exhibition goes into all of this in fine Dutch detail. Something terrible happened to him. Exhausted by overwork, angry at the critical dismissal of his work during the few times he exhibited, weak from a diet that included coffee and absinthe but not much else, and stressed beyond endurance by having the recalcitrant Gauguin as his house guest, he didn't survive. His brother, by now married and with a child and ill himself, was finding it difficult to support him, writing to imply they had to watch their finances. This, sadly, could have been enough to send Vincent over the edge. The visitor to this exhibition must look, look closer, and make up their own mind. Gallery Different's gallerist Karina Phillips tells me there is now a new way of buying a designer handbag. Clients come in and buy one of her designer prints of the bags to hang on their walls instead. The collection includes two versions of the Birkin and a sensational Piet Mondrian inspired version. 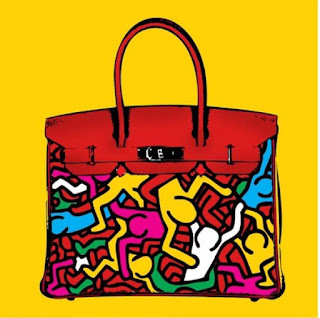 All this does not surprise me - what an after-supper talking point, especially when you tell guests a print costs £595 ready framed, considerably less than the £8000 it costs to buy one of the bags. In addition, once you've hung up your print, your hands are free and it's impossible to leave it on the tube. The rest of the show is pretty desirable too - two floors of brightness and summer flare. The enterprising Gallery Different also runs an art buyers' club and a single acquisition buys you membership. Percy Street lies on the western side of Tottenham Court Road between Goodge Street and Tottenham Court Road tubes at W1T 1DR. It's a gallery that makes visiting that street a very pleasant experience indeed and you can pick up some Gail's bread at 11-13 Bayley Street across the road at the same time.